10 May 2018, at 12:00a.m. Following its launch in January, Zoetis has released the results of a series of studies around the biological properties of Suvaxyn® PRRS MLV, an innovative vaccine containing a modified live European Porcine Reproductive and Respiratory Syndrome (PRRS) virus strain. The single-dose vaccine, which is based on a European PRRS virus strain and registered for use in the European Union, offers the earliest piglet vaccination from the first day of age, reducing viraemia and nasal shedding caused by infection with European strains of PRRS virus. 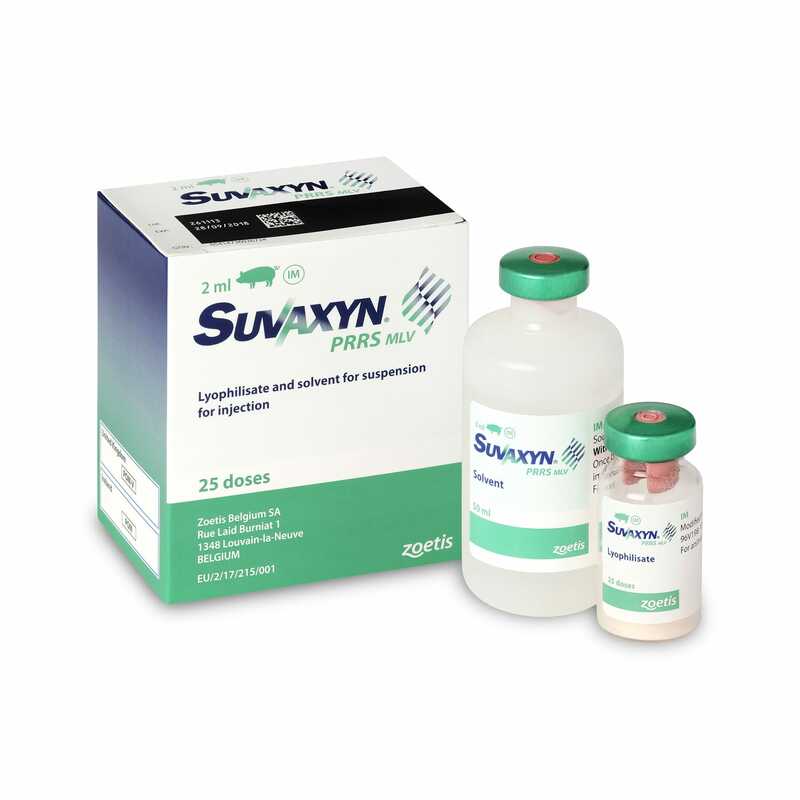 Suvaxyn PRRS MLV is also approved for mass vaccination of sows and gilts. Presenting the findings at a Zoetis meeting ahead of the 2018 European Symposium for Porcine Health Management in Barcelona, Research Director, Global Biologicals Research for Zoetis, Jay Calvert, said the studies strongly suggest that the vaccine strain in Suvaxyn PRRS MLV has a higher affinity for porcine alveolar macrophages (PAMs) when tested against four competitor vaccines, as it produces higher virus yields when titrated in PAMs in an in vitro test. “PAMs are the primary target for replication of the PRRS virus in pigs, while porcine CD163 is a key PRRS virus receptor and essential for infection of PAMs,” he explained. “In the development of most modified-live PRRS virus vaccines, the strain selected is typically attenuated by multiple passages on a non-PAM cell line. During the process of attenuation, the virus loses pathogenicity as it accumulates mutations that favour its replication in a different host cell (non-PAM and expressing a CD163 receptor of non-porcine origin). “While the other live PRRS virus vaccines were produced using cells of simian origin, we used a different approach to attenuate the virus. Indeed, we use a recombinant cell line that expresses the porcine virus CD163 receptor instead of a cell line that expresses a non-porcine (monkey origin) CD163 receptor. The benefit is that the vaccine strain can replicate in the target cells, after vaccination, without the need for re-adaptation to the porcine receptor,” said Dr Calvert. To protect herds from PRRS, producers have traditionally vaccinated pigs around three to four weeks of age when maternal antibodies are typically low enough not to interfere with the vaccine’s ability to trigger the desired immune response. However, recent studies show that Suvaxyn PRRS MLV vaccine can overcome maternal immunity when given as early as one day of age, providing an early immune protection . Likewise vaccination of seronegative animals was shown to provide immune protection that lasts until slaughter. Dr Monica Balasch, Associate Director, Global Biologicals Research for Zoetis, said the ability to administer the vaccine from day one is a game-changer in the PRRS protection paradigm. “Being able to vaccinate from day one helps bridge the gap in protection between the loss of maternal immunity at three to four weeks of age and the onset of active immunity, which was demonstrated four weeks after the vaccine is given,” she explained. According to Dr Balasch, the MLV vaccine (Suvaxyn PRRS MLV) used in this study is currently the only one authorised for use from day one in Europe, owing to its proven safety and efficacy in very young piglets. However, she added, earlier protection does not have to mean leaving pigs vulnerable later in life, when they are at peak economic value. This viral pig disease is very costly for the swine industry in most countries in the world. It causes reproductive losses, lowered farrowing (birth) rates, increase in abortions, stillbirth, mummified fetal pigs, as well as weak live-born piglets, and deaths. It also causes respiratory disease in pigs, impacting growth performance and is often complicated with other bacterial and viral co-infections. 1. Data on file, study reports B820W-ES-17-725 and B820W-ES-17-726, Zoetis Inc.
2. Fort M et al. “Vaccination of 1-day-old pigs with a Porcine Reproductive and Respiratory Syndrome Virus (PRRSV) modified live attenuated vaccine is able to overcome maternal immunity.” ESPHM 2018 Abstract Book. 4. Fort M et al. “Vaccination of 1-day-old pigs with a PRRSV modified live attenuated vaccine confers protection until slaughter.” ESPHM 2018 Abstract Book.